Cut onion, pepper and tomato into thin wedges and place them in a large mixing bowl. Add flank steak, #4 Tingly or #7 Sultry Sauce™, 2 tablespoons oil, salt and pepper to taste and toss gently. On a high heat, place oil in a large skillet. Toss a small portion of mixed meat and vegetables and cook on high heat, stir occasionally. When meat is cooked, place in a serving bowl and repeat steps 4 and 5 until all of the veggies and meat are cooked. Heat 4 soft tortillas at a time in a microwave between 2 moist paper towels for 35 seconds. 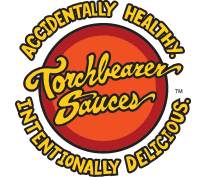 Enjoy with some extra TorchBearer Sauce or Sour Cream.